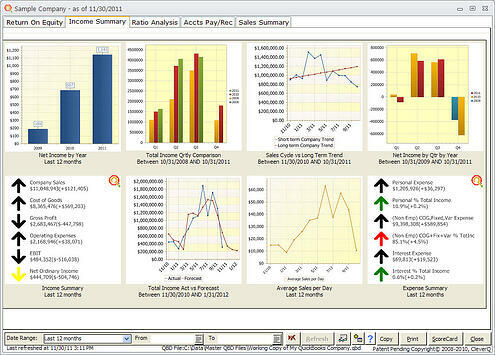 Web access available with SME Business Industry Benchmark Software for BI Consulting. Data Mining for database & ODBC connection. CleverQ® business management software includes powerfull business analytical tools, seasonal trend analysis, seasonality forecasting and much more. Collaborate strategic goals & business intelligence through interactive dashboards, enterprise information portals, and the business strategy Training Facilitator™. The included built-in report designer and report manager delivers highly formatable results via e-mail, the web, or embedding into other enterprise programs. CleverQ's highly customizable Business Management Control System collaborates data sources including databases, Excel spreadsheets, multiple QuickBooks company files, & QuickBooks Reports for strategic management and cost management control. Perform business analytics, predictive analysis, seasonal trend analysis, seasonal forecasting and financial analysis, visually displaying Key Performance Indicators in interactive dashboards, scorecards, and a powerfull enterprise report manager. Drill down through gauges via an enterprise portal to graphs, details, reports, websites, spreadsheets, other software programs, and more. The patent pending Training Facilitator knowledge portal conveys business intelligence, company strategic goals, training, and conditional business advice downstream to business units, departmental managers, and employees for decision making.